Gremlins is a Horror movie starring Zach Galligan, Phoebe Cates, and Hoyt Axton. The movie was directed by Joe Dante and released by the Amblin Entertainment studio on 1984-06-08. The movie has an MPAA Rating of PG-13 (Parents Strongly Cautioned). Our users found the overall impression of this film to be Exciting. The movie's official site can be found at www.warnerbros.com. Gremlins and its sequel (Gremlins 2: The New Batch) are both part horror movie and part comedy movie - with Gremlins leaning more towards the dark side than its sequel. The movie takes place during Christmas. The main character, Billy Peltzer, and his father, Rand Peltzer, visit a Chinese antique store and encounter a strange little creature known as a Mogwai (which translates to "monster" in English). Billy and his dad want to purchase this creature, but the shopkeeper does not want to part with him as he doesn't believe that they will be responsible enough to care for him. Disappointed, Billy and Rand leave the store. Moments later the shopkeeper's grandson comes outside and sells them the Mogwai because they need the money. There are three main rules for looking after a Mogwai and they are as follows: First, do not put it under bright lights as this will hurt or potentially kill the creature. Second, do not ever get it wet. Finally, you must not ever feed it after midnight. After taking the Mogwai home, Rand takes off to an inventor's convention and leaves Billy with the creature. Billy names the Mogwai Gizmo and they become friends. Of course, this wouldn't be much of a horror movie if everything went smoothly. Billy does not do a good job following the rules and accidentally spills water on Gizmo. This causes several Mogwai to spawn from Gizmo - only these ones aren't all warm, fuzzy, and adorable like Gizmo. Somehow, Billy doesn't immediately realize this and has plans to sell them. Anyways, one thing leads to another and the entire town becomes overrun with these evil Mogwai's - called Gremlins - and the rest of the movie is spent trying to fix the problem that Billy started by being careless. I actually saw Gremlins 2: The New Batch first. I still remember going to the movie theatre and watching it on the big screen. 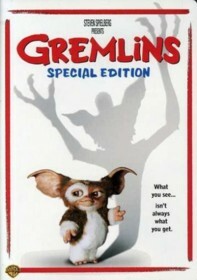 Recently I saw the blu-ray version of the original Gremlins at my local blockbuster and had to rent it. Overall, I didn't enjoy the original movie as much as The New Batch mainly due to Gizmo not looking as good or as cute as he did in the sequel. Also, I didn't enjoy the darker tone of the original (i.e. a horror movie taking place during Christmas, etc. etc.) as much as the lighthearted tone of the sequel. I also found the different types of gremlins to be more interesting in the sequel - but overall, I still found this to be an excellent movie. The acting in the movie was very well done and the special effects - for the time the movie came out, 1984 - to be amazing. The sound effects were similarly good and the theme song is extremely catchy and memorable. The plot isn't that great, but given the sheer amount of new ideas presented in the film, and the humor of the film, I didn't find having a great plot to be all that important. Overall, I highly recommend watching this film. I'm still hoping that they one day complete the trilogy. Gizmo is awesome :).